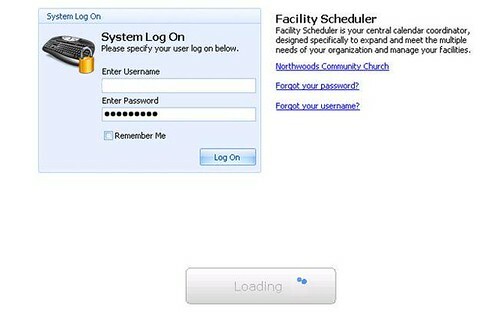 As I have discussed before, Northwoods uses ACS Facility Scheduler as the primary application for all facility calendaring, global ministry calendaring and also the data source to populate our website calendar (web calendar is still in development). We deploy this application, as previously documented, to our users via a terminal server. The Terminal Server environment allows us to install the application in on place and let everyone on the network use it. Note: We are still using Server 2003 for this application so no need to comment on the use of TS in place of Remote Desktop Server Most of the time this works without much of an issue but a recent update to Facility Scheduler started causing us some problems. For future sanity I am documenting the problem as well as the solution. ACS released Facility Scheduler 2010.1 earlier in March, for the most part the built in updater ran without an issue and all existing terminal server users were able to choose update and login without any issue. But after the update we started to notice users who had not ever logged into the terminal server before (new network accounts) weren’t able to launch facility scheduler. The individuals would login to the Terminal server launch the Facility Scheduler application and then be prompted to update to 2010.1. The update would complete and the login would display. After the update they would enter their login credentials for the application and the loading animated icon would appear but wouldn’t be animated. After 1-2 minutes of waiting the application would close. This process happened every time the user tried to launch Facility Scheduler. Further digging revealed this only happened after a user local profile had been deleted from the Terminal Server or the user was logging into the Terminal Server for the first time. Since we installed FS on the terminal server and put the Application Data in the default user profile that application data was several revisions out of date (2008.1.9.6). Since there is no auto update feature for the “default’ user profile it was forgotten when everyone else updated. This resulted in new user’s profile being created with the outdated version of FS and the updater couldn’t apply 2010.1, causing the login to crash. (Where “Username” is the network username of the user who cannot launch Facility Scheduler. Delete the User Profile(s) for the user account(s) that aren’t able to launch Facility Scheduler. Have user login and launch Facility Scheduler. Previously I documented the process for installing ACS’ Facility Scheduler Application on a 2003 Terminal Server as noted [Here]. But now its time to upgrade our ACS Remote Desktop Server to 2008r2 and the process for installing FS is a little different. So here were our steps, your mileage may vary. 1. Download the latest installer from the ACS Client Portal. 2. .NET3.5 is included in 2008r2 but when you start the ACS FS installer you get the error displayed below. The next logical step would be to install .Net Framework, but remember it comes with Server2008r2, so you can’t just install it as the error below notes. Rather you have to enable it not install. 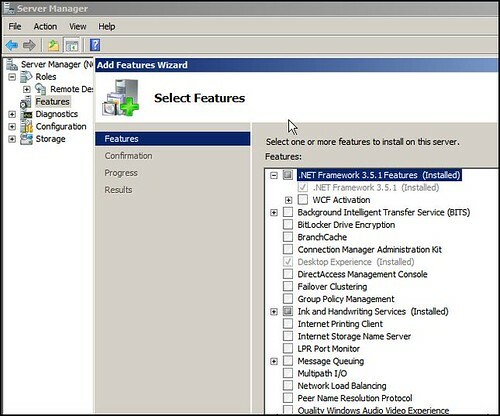 The error notes to use the Roles Management tool, which you might think is Adding or Removing Roles, but what the error message really means is to go to the Server Manager then the Features item in the display tree then and then select add Feature to enable .Net 3.5.1. 3. After you have enabled .NET Framework 3.5.1 you can run the ACS Facility Scheduler installer. 5. You may be prompted to download application updates, if prompted choose yes to update. 6. Once the updates are complete you should be able to login to FS with your login. 8. Test your work by RDPing into the server (with an account that hasn’t logged into the server or the profile has been deleted) and you should be able to launch Facility Scheduler and access the application. If ACS pushes out updates between the time you do the original install and the first time the user is logging in they may be prompted on the first use to update the application, if so choose yes and let the application update and then launch. Earlier this week we were putting the final touches on deploying Facility Scheduler to all our users. This is an exciting event since we have been in the development stages of FS for over 18 months with the team at ACS and it was finally time to make it available to all our staff. We elected to make this available to our staff the same way we have made ACS Desktop available, with a terminal server. We followed the steps to install Facility Scheduler on the terminal server several weeks ago and it worked with no problems. Since we installed the application there had been an update, which we ran under the admin user account on the server. Jeremie made the application avaiable to all users so we decided to check that the application would work for all users. It was a good thing we checked since the application for each user went into a loop trying to update the application even though it was already updated. A quick call to support pointed us to the Program Manager for Facility Scheduler, Darci Shelley. We work with Darci often and participates in our confrence calls that happen every other week with ACS so we were confident Darci could help us fix the problem… except she wasn’t on call and I didn’t have her contact info… so Jeremie and I sent Dean Lisenby a tweet for some help. We explained to Dean our problem of the next day’s go live demo for all staff and quickly Dean responded and had contacted Darci at home and told us she was online and available to assist us once her kids were in bed. Once Darci was online she helped us work thru our issues with the application and troubleshooting our problem for over an hour all while at home. While working with Darci we identified a bug in the current version of Facility Scheduler running on a Terminal Server that will have to be updated before the next release. So two thumbs up to Darci for providing top notch support even when she didn’t “have to”. 1) Install ACS Facility Scheduler as an administrator. 2) Once the installation is complete, go to C:Documents and SettingsAdministratorLocal SettingsApplication Data. 3) Copy the ACSTechnologies folder. 4) For each user on the Terminal Server, paste the folder in the following location: C:Documents and SettingsusernameLocal SettingsApplication Data. 5) To place a shortcut on the Terminal Server desktop for all users, go to Start->Programs->ACS Technologies, right click on ACS Facility Scheduler, and select Copy. 6) Go to C:Documents and SettingsAll UsersDesktop, go to Edit, and select Paste. Now when any user logs into Terminal Services, they will have an icon on their desktop to launch ACS Facility Scheduler. The first time they open Facility Scheduler, it will show the admin user name, but once they have entered their user name for Facility Scheduler, this name will be saved and will show for each subsequent login. You can copy the ACSTechnologies folder to the C:Documents and SettingsDefault UserLocal SettingsApplication Data. Then any new user profile created will include the Facility Scheduler application. This worked for us since we had to do some account clean up to get rid of old Terminal Server profiles. We deleted all TS profiles except the admin user’s profile and had users login “fresh”. When they logged in the users had the icons and access to the application. The update feature for Facility Scheduler application doesn’t work for any users other than the admin user who’s login you used to install the application. The temporary work around until the fix is released is to follow the above procedure again and overwrite the ACSTechnologies Folder for all users. When updating to 10.0.12 from a previous version the Icons for Ministry Scheduler and other ACS modules vanish for all users including the local administrator. After running the 10.0.12 update our users noticed that random ACS icons that were on their desktops or in the start menu were gone. After a call to the MegaChurch support group we found out that support has noted this is a know issue that they though was resolved, but obviously hadn’t been fixed. The solution is to go into ACS Utility Manager by going to Start>All Programs> ACS> ACS Tools> Utility Manager and then selecting Rebuild Program Group. This utility recreates all the default shortcuts in the start menu and desktop for the all user profiles. 1) When will ACS Desktop Suite allow a username to be more than 8 characters? The 8 character limit was something I raised concern about over a year ago (11/5/07) but this issue still isn’t resolved. If we had the ablity to use more than 8 characters we could use the Windows login integration in ACS but since almost 100% of our userIDs are more than 8 positions we cant… When will this be resolved? Or better yet when will the ACS Desktop suite integrate to AD for authentication and setting rights thru AD groups? 3) What is the status of the ACS Outlook Plugin and Vista Gadget to search ACS records from Outlook and the Vista Gadget tool bar? Rumors are that the Outlook Plugin is ready now and the gadgets are comming soon… how do we find out about this stuff? 4) What is the status of the Silverlight Screen Display Beta that was expected to be released by mid October? 5) When will ACS technical services have a blog or some vehicle to communicate these types of bugs to the users rather than the current scenario where customers have to “find” these bugs before ACS support says “Oh, yea we knew about that”. I know this type of info isn’t appropriate for the corperate blog, but there shold be some way that customers that want this information to be able to subscribe to this via a RSS feed.